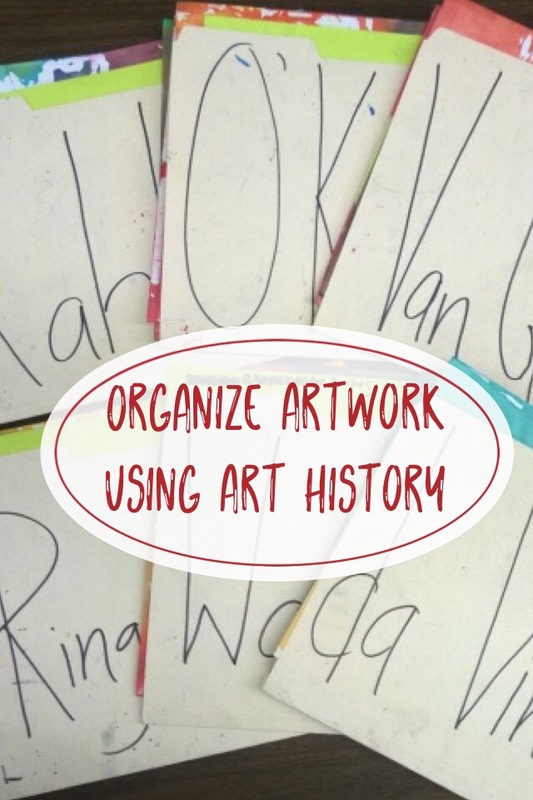 Organize your Art Schedule with Color! Classroom Video Tour: Organize with Color! I was lucky to find out what my schedule for this year would be about a month before summer started. That gave me time to wrap my head around changing from a quarterly system where I saw third and fourth graders every day for nine weeks, to a schedule where I would see the whole student population once every 6 days. I jumped into high gear and started making sketchbooks like crazy. Students who had finished a project early were eager to join our assembly line of counting, folding and stapling paper. When I locked up my room for the summer I had stacks of over 900 sketchbooks sitting in my closet. But I hadn’t quite decided how I was going to organize them. I knew I wanted to put them in plastic bins on the shelf. When I got back to school in August, I decided to work out a color coordinated system, so that every rotation day was the same color. After putting labels on all 38 sketchbook bins, I stepped back and realized I had created a giant schedule wall that I could follow throughout the week. After putting labels on all 38 sketchbook bins, I stepped back and realized I had created a giant schedule wall that I could follow throughout the week. (To make things extra complicated, my last three classes of the day are 2nd graders who are on a Monday-Friday rotation. Their bins got different colors.) In the morning I can glance at the sketchbook shelf and see which classes are coming to art. The thought that stressed me out the most was keeping track of all of that “artwork in progress” from week to week! In the past, I’ve used my set of plastic drawers so that each class time has their own drawer to store their artwork in. I only have 9 drawers in all, and my room size and wallet couldn’t handle buying 29 more! I decided to dedicate each drawer to a class time and store all six classes who come at that time in the same drawer. I decided to dedicate each drawer to a class time and store all six classes who come at that time in the same drawer. I used the same color labels again on the outside of the drawer, so I can easily see where each class’s artwork goes. Inside the drawer I have a big purple folder for each class. They were easy to make – 18″ x 24″ construction paper folded and stapled. I labeled each of those big purple folders with… you guessed it! The same colors that were on the sketchbook bins. Each big purple folder has six file folders labeled with the table names for my classroom. My students use the file folders to turn in their art at the end of class. Inside the drawer I have a big purple folder for each class… Each big purple folder has six file folders labeled with the table names for my classroom. My students use the file folders to turn in their art at the end of class. It was so much fun to change up the table names for the new year! I love picking new artists to highlight on each table’s supply box. It was time consuming to write artist names on the front and back of 228 folders, but they will also double as signs for the drying rack. And they make passing back artwork crazy quick and easy. Another huge concern I had was finding a way to store all of the finished artwork for our Showcases at the end of the year. I spent a lot of time clearing off 7 of the big shelves at the back of my room. I labeled each shelf with the times for each class period and made larger folders out of thick poster board to create portfolios where I can store each class’ finished projects. We’ll see if they end up being big enough for a year’s worth of artwork. While the kids watched the video tour of the art room (which they were glued to! ), I filled out seating charts for that class. Oh man, what a life saver! While the kids watched the video tour of the art room (which they were glued to! ), I filled out the seating chart for that class. It only took 5 minutes each class period, but that would’ve been 3 hours of planning period time! And it was so nice to know that every single class heard all of the same information. (After repeating myself that many times, I always forget important parts. I may still be in the honeymoon phase, but I have high hopes for this organization system! I’m sure over the course of the year, I’ll be changing it here and there. But for now it makes me feel like I’ve got this crazy rotation schedule under control! Posted on September 13, 2016 April 23, 2017 Categories Classroom Management, Classroom Procedures, Elementary School, Video TourTags Classroom Management, Classroom Procedures, organize artwork, printables, Video TourLeave a comment on Organize your Art Schedule with Color!